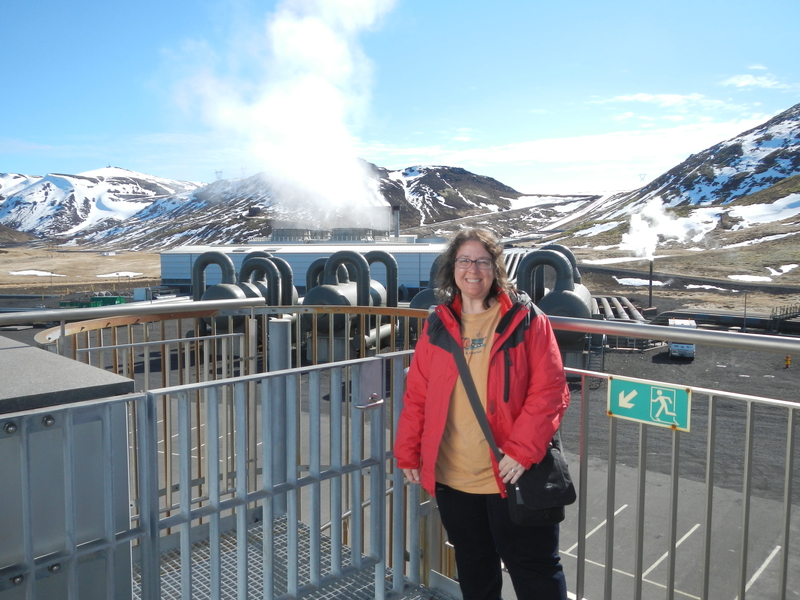 Here I am at the largest geothermal power station in Iceland and the second largest in the world. The Hellisheiði Geothermal Plant is situated at Hengill, an active volcanic ridge in southwest Iceland. Today was a marathon day of Icelandic geologic features – but I would not have wanted it any other way! We made great time traveling from site to site today, because of extremely light traffic on the roads. Our local guide explained to us that today is Holy Thursday, a religious holiday 40 days after Easter Icelanders celebrate. On the drive to our first stop, our guide pointed out a hydrogen fueling stations for cars in Iceland, located right next to a gas station. Hydrogen cars are increasing in popularity in Iceland in part because of the “cleanness” of the fuel (no carbon building up in the engine, less service needed). We also learned about the amount of tree planting going on in Iceland, which is called afforestation (versus deforestation). There are not many trees in Iceland because of past land use, so millions of tree seedlings are being planted. But there are two issues with this: (1) trees take longer to grow in Iceland, because of the climate; and (2) not all of the tree species being planted are native to Iceland, so some people want to remove these trees and allow just the natural vegetation to grow in its place. An interesting topic for continued discussion, to be sure! 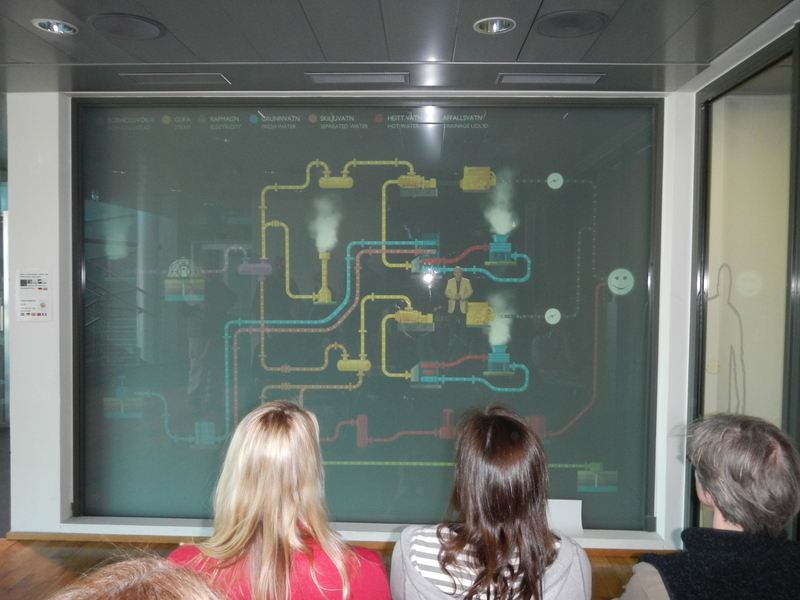 Our first stop was to the Hellisheiði Geothermal Plant at Hengill. This facility provides heated water and electricity for the residents of Iceland. The plant has drilled several boreholes down to 3,300 m (almost 11,000 ft) to tap into borehole fluid that registers 300 degrees C (~570 degrees F). The fluid goes in to a steam separator for the separation of steam and hot water, then the steam drives one set of turbines… it is all explained in the image below, which I snapped during an orientation video our group watched. I purchased an excellent video at the plant about Iceland’s geothermal past and present that I can’t wait to show my students. Here, in a nutshell, is the flowchart that describes how geothermal energy is produced/captured for the residents of Iceland. Interestingly, between geothermal and hydropower, Iceland can generate more electricity than they have demand for. As of now, it is too expensive to export electricity, but stay tuned for the development of one idea, constructing an undersea cable to Europe to transfer that power. Another interesting point is that all of the pipes at the power plant are on wheels because of earthquakes. In 2011 alone, there were over 2,000 earthquakes in the region. 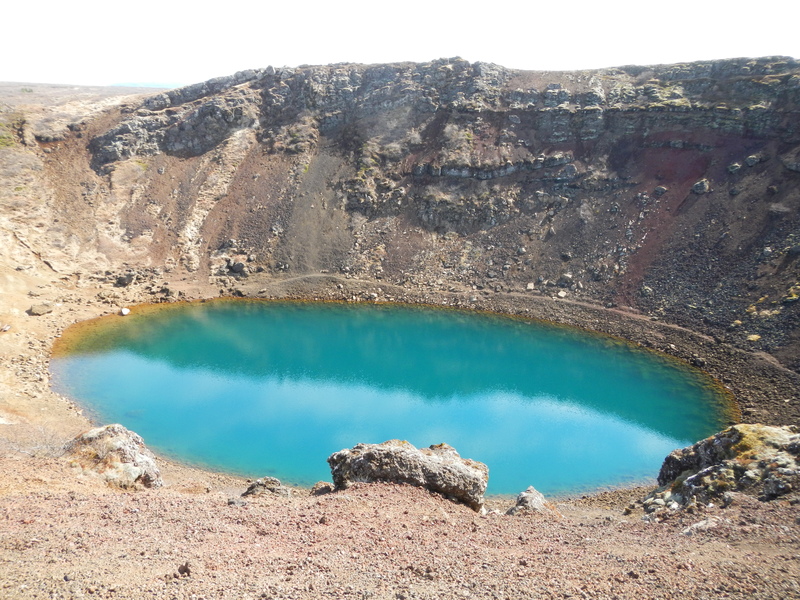 Our second stop – Kerið, a volcanic crater lake located in the Grímsnes area in south Iceland. Originally, geologists thought this was a lake that formed after a volcanic eruption “blew off the top” of the volcano. But evidence, such as the lack of an ejecta blanket and a lack of massive rubble typically found at violent eruption sites, has allowed geologists to form a new interpretation. It is now believed that this volcano did erupt, but it was not until after the magma chamber emptied that the weight of the overlying cone/neck of the volcano collapsed under its own weight. The bottom of the crater intersects with the local water table, so it is groundwater and not rainfall that has filled the bottom. You may also see this feature referred to as a caldera, instead of a crater, because of its dimensions. It’s a bit of a challenge fitting such a large landform in the camera lens! If you look to the far left edge along the middle, you might be able to see the park bench inside Kerið for scale. 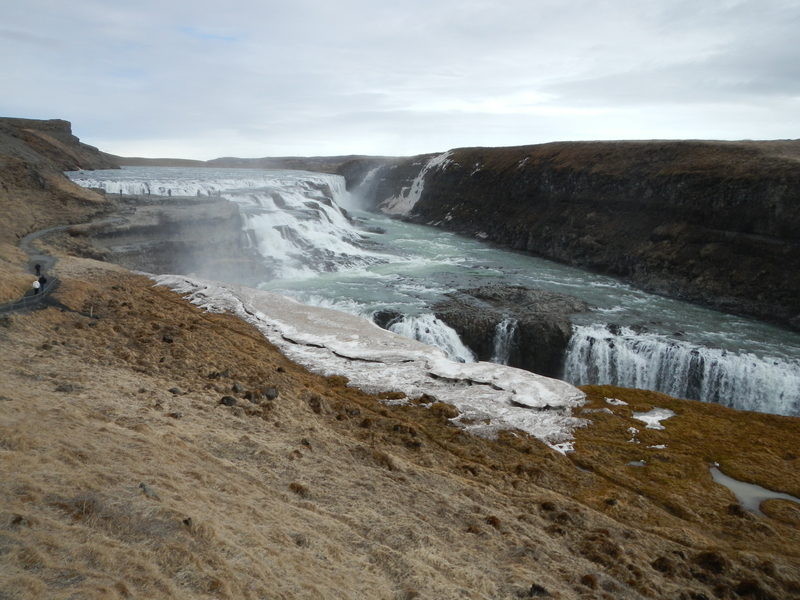 Our third stop – Gullfoss, a multi-level waterfall (including a right turn!) on the Hvita River which dissects multiple basalt layers. The falls cuts through some beautiful columnar basalt, overlain by horizontal layers, then again topped with columnar basalt. Beautiful, beautiful, beautiful. A view of Gullfoss that does not do this geologic feature justice! A person is on the far left side for scale. Image taken at the lower observation level. Our fourth stop – Haukadalur Valley, home to the hydrothermal field with Geysir and Strokkur. If you have visited Yellowstone National Park before, then you will recognize these features. You can’t help but be mesmerized by the pools of bubbling hot water and constant steam rising from the landscape. One difference between here and Yellowstone is that Strokkur geyser erupts more frequently – approximately every eight minutes. View the video below to see one of the eruptions I captured. There are not many places in the world where people can get so close to geysers, and I feel fortunate to now have been to this field in Iceland. 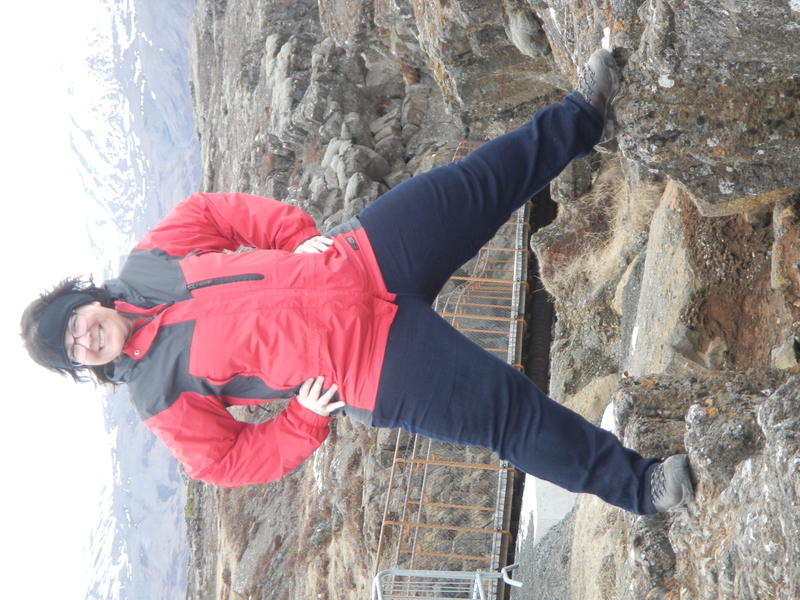 Our last stop captured the inner geo-geek in all of us – the rift valley at Thingvellir. What transformed us into geeks? It wasn’t because this site is a national park and on the UNESCO World Heritage List (although, that is pretty cool, too). Recall that in my first post about this Iceland trip, I mentioned that Iceland is right on a plate boundary, with the Eurasian plate to the east and moving east, and the North American plate to the west and moving west. This particular location is a grabben where you can actually walk through where the divergence between the plates is occurring. AND, there is a spot where you can stand with one foot on one plate, and one foot on another plate! We all posed for this photo. Since the majority of the plate boundaries occur under the oceans, there are not many places on this planet where you can stand and straddle two tectonic plates. I’m having an amazing time in this short course and learning so much about Iceland geology and Iceland history and culture – and I’m not done yet! I’m with an amazing collection of colleagues, and not only have I made some new friends, but so has the Nittany Lion! Another person in this short course travels with her own mascot, nicknamed “Little Baik” after Lake Baikal. 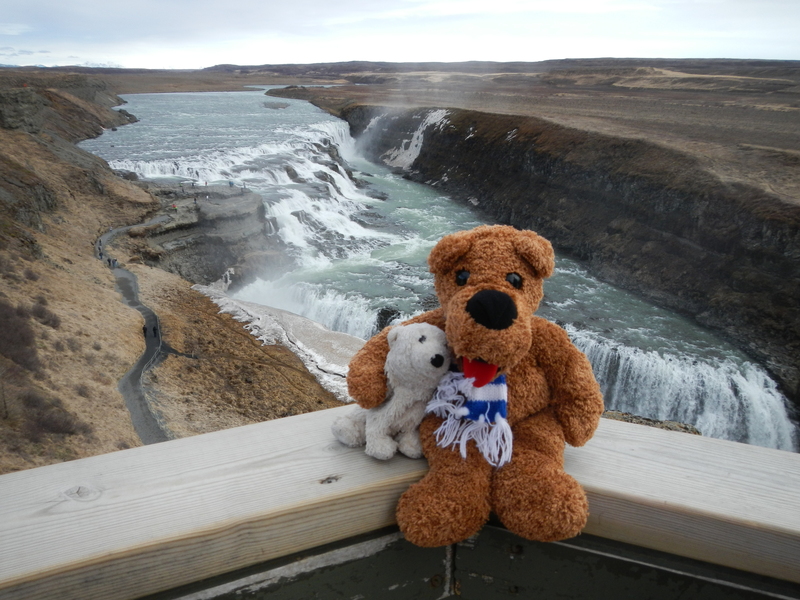 As we were both taking out our mascots for photos during the day, we decided at Gullfoss to have them both pose for a photo together! The Nittany Lion and Little Baik – new friends in Iceland! Have fun and please continue to post your thoughts and pictures.